Picasa has a neat feature that is not turned on by default. In browsing and editing image, there is an icon with colorful hat on the lower right corner next to a slider bar. 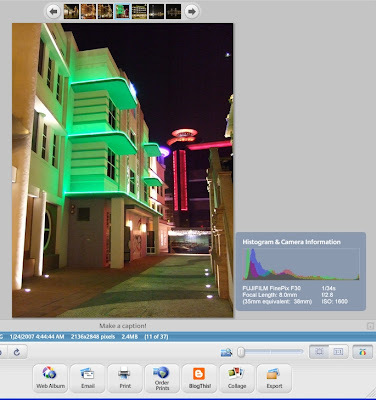 Once turned on, an histogram is displayed for the image and any adjustment to contrast and color will be seen interactively in the histogram. It is a very neat feature that I count on in previewing pictures done with Fuji F30 which totally misses the very important feature with histogram. ok, what do we need now is a tutorial about how to use a histogram, dont we?